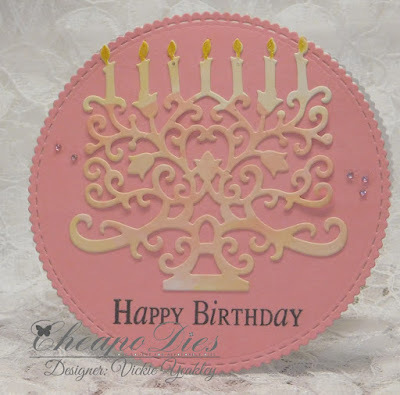 Vickie Y sharing a round birthday card with you today using the Exclusive Cheapo Fancy Cake die. 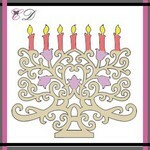 Shaped cards are easy to create and fun to give for any occasion! 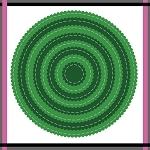 Fold a piece of cardstock in half, place the edge of the circle die about an eighth of an inch over the fold and run it through your die cutting machine. It will take a couple of passes to cut through the folded cardstock. For my card I used white cardstock for the fold and then used the same size die to cut the pink cardstock and lined it up over the fold and glued it down.